This WILL become one of your favourite salads, I am sure! Preheat oven to 200 C or 180 C fan forced. Line an oven tray with greaseproof paper. Add potato and crushed garlic cloves, drizzle over 1 tbsp oil and season with salt and pepper. Toss to coat. Roast, turning occasionally for about 25 – 30 mins. Meanwhile, combine spices and 1 tbsp. oil in a bowl or zip-lock bag and add chicken. Coat well in spices (you can do this in advance if you want). Heat an oven-proof pan over a medium heat (if you don’t have a saute pan suitable use a frying pan and transfer to an oven tray) and add the chicken, skin-side down. Turn over and seal other side then place in the oven for 10 mins or until just cooked through. Remove from oven and rest for 5 mins. Combine potato, watercress, leaves, pecans and parsley in a large bowl. Drizzle over lemon juice, molasses and last tbsp. olive oil. Toss to combine. Divide among serving plates or place in large salad bowl. 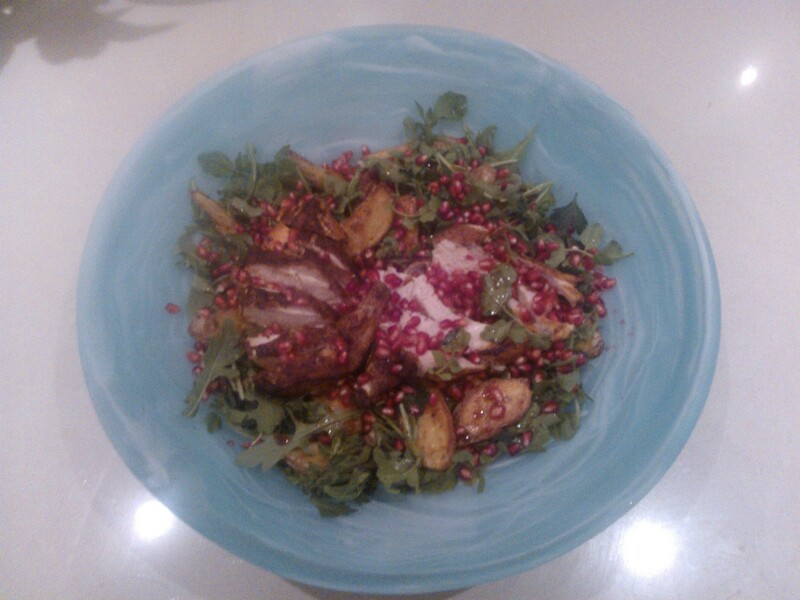 Slice chicken, place on top of leaves, sprinkle with pomegranate seeds. Serve with generous amounts of good quality aioli.